The global Charlie Hebdo debate rages. One thing is unanimous, everybody agrees nobody should be shot for a cartoon no matter how much it insults your "god". Another almost as universally agreed to is nobody should ever kill somebody in the name of their "god". Then we get to much more mucky 'free speech' issue. Just yesterday the Pope said in speech in the Philippines that there are 'limits' to free speech. [more good pope-ing IMO]. This morning Charlie Hebdo's founder said the murdered editor ‘overdid’ provocative cartoons. My muddy 2 cents worth is that after seeing many of Charlie Hebdo's cartoons recently, none of them are funny, all of them are slanderous at best, most are disgusting. Free speech doesn't mean we don't as a society set limits. We say ya can't yell FIRE in a theater cause people can/will be trampled. Doesn't mean ya can't yell FIRE down the road someplace else. Seems to me it's OK to say lottsa stuff that it's not OK to sell at the news stand. France has a long history of tolerating this type of trashing of both real and imaginery beings. Charlie, for instance, got his name from when Charles DeGaulle banned it decades ago. 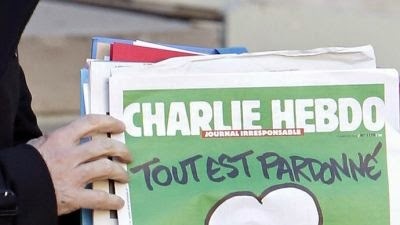 Charlie Hebdo trashes 'em all with equal slanderous, un-funny, results. If i was dictator i'd tell Charlie to keep his disgusting crap out of the public realm or go to jail. But, unfortunately, neither the French or anybody else has had the wisdom to make me dictator so i'll just have to stick to kibbitzing like millions of others. 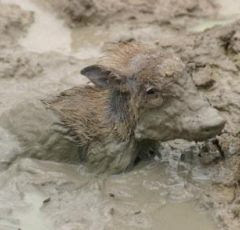 The Mud Report has slung plenty of mud and will continue to, though sometimes a bit out of the strike zone, this blog aims always at the ideas never at the thinker of them personally. It's terrible that people can get so caught up in their beliefs, religious or any other, so blinkered to the wider reailty that we - the flora, fauna, microbes, minerals, forces and fareries - are all cousins, all in this together. Blinkered and siloed they will say and do to 'others' what they never would if unblinkered.